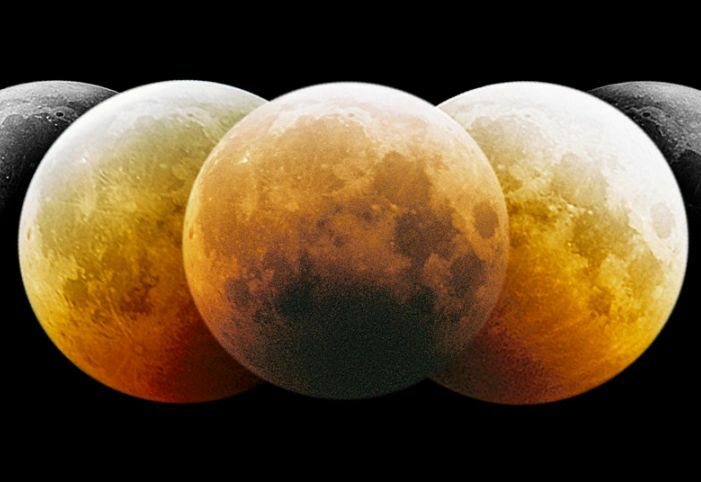 Explanation: After watching this month's lunar eclipse, amateur astronomer Sebastien Gauthier carefully composed this montage of telescopic images of the Moon sliding through planet Earth's shadow. While the deepest part of the total eclipse corresponds to the central exposure, the play of light across the lunar surface nicely demonstrates that the planet's shadow is not uniformly dark as it extends into space. In fact, lunar maria and montes are still visible in the dimmed, reddened sunlight scattered into the cone-shaped shadow region, or umbra, by Earth's atmosphere. For this eclipse, the Moon's trajectory took it North of the umbra's darker core, seen here cast over the Moon's cratered southern highlands. Gauthier's telescope and camera equipment were set up near the Trois-Rivieres College Champlain Observatory in Quebec, Canada.